Originally published in the BYRON BAY BLOG. For more information about this publication or the beautiful Byron Bay area, click here . Congratulations Byron Shire! You have recycled 2,300 tonnes of food and garden organics in six months! This has reduced Council’s putrescible landfill waste transport and disposal costs by approximately $150,000 since the implementation of the three bin collection service in August. Plus, Byron Shire has on average 30 per cent less kerbside waste going to landfill compared to the previous two-bin system. Of the total kerbside waste collected each month, an average of 31 per cent is organic materials, 32 per cent recycling and the remaining 37 per cent is landfill waste. Mayor Simon Richardson thanked residents for being a ‘good sort’. 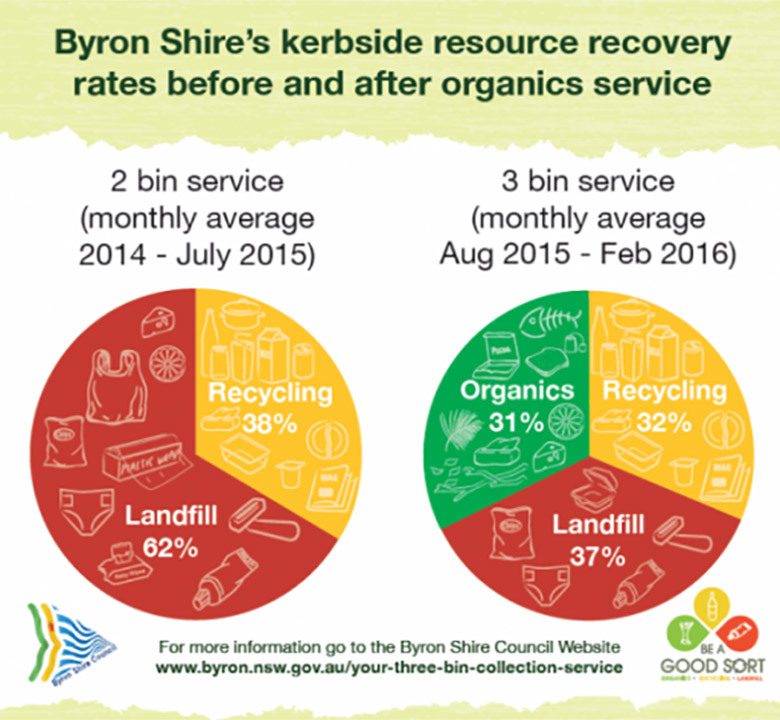 “Overall Byron Shire’s kerbside recycling rate is now 63 per cent, compared with 38 per cent prior to the introduction of our organics service. It’s a great result. “Particularly impressive is that we have maintained this over the extremely busy Christmas holiday period. But we can do better, let’s aim for a total recycling rate of 70 per cent,” he urged. 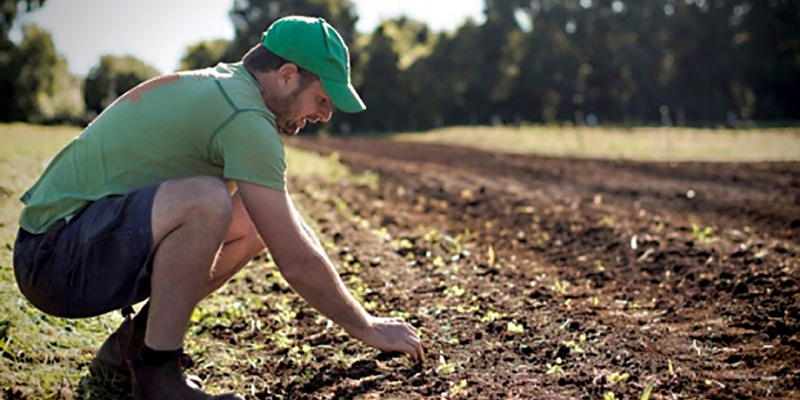 Instead of being buried in landfill, our organic materials are processed into certified organic compost at Lismore City council’s composting facility and used by local farmers and growers to improve agricultural soils. 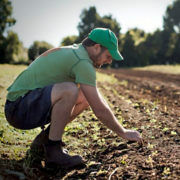 Local farmer and founder of social enterprise, Munch Crunch Organics, Alasdair Smithson, has been using Lismore’s kerbside organics compost for seven or eight years. “Overall we are happy with the product and it is a good soil improver, hopefully we can do it in the Byron Shire soon too,” he said. Alasdair thanked the community for contributing their organics because the compost is being used by local farmers and growers. “It’s really important to us as organic farmers, that we return organic waste back to the soil to build the organic matter and reduce the effects of climate change by doing so,” Mr Smithson said. Suffolk Park resident, Suzie Morley is happy to have been part of this important environmental initiative and says the three bin system works well for her family of four. “We compost anyway and have a worm farm, but we were producing more organic waste as a family than the worms could cope with,” Ms Morley said. Ms Morley said the key to making the system work is to have three bins set up in the kitchen. Organics bin contamination continues to be very low; Council is still keen to remind residents not to use plastic bags, degradable or biodegradable bags in the organics bin. Place food organics inside a green compostable caddy liner, wrap scraps in newspaper or place directly inside the caddy. All food and garden waste, including things like meat bones, seafood and soiled paper can also go in the organics bin. 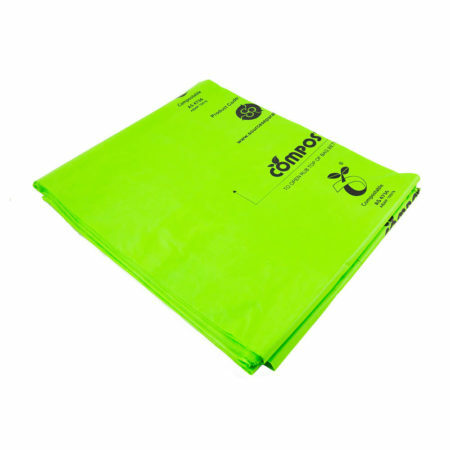 Yellow bin recycling results are also good, but the main contaminants are bagged hard plastic recyclables and loose soft plastics. This has the potential to spoil a whole truckload of recycling and everybody is needed to stay on board and put the correct items into each bin. If you need a reminder about what items go in each bin, check the A-Z Recycling Guide on the Byron Shire Council website. As part of the 3 bin collection service, Council continues to conduct weekly visual bin contamination audits which are a great way of providing extra education to our residents about what items can go in each of the bins. We’d also like to thank the Byron Shire Echo for supporting this local environmental initiative by introducing a green compostable bag and we encourage anybody else in the same position to jump on board and use compostable instead of plastic bags!